Premium Body Oil 1/3oz roll-on (BASIC LABEL) - As Low As $0.99! Glass Bottles 1/2 Dram - As Low As 0.12! We offer the same great silk base with aloe and vitamin E as the more concentrated fragrance oil spray. These body sprays are scented with 15% pure fragrance oil so they can be used as both a perfume/cologne spray as well as a body spray. Body sprays are highly popular and store products are high in alcohol and other skin drying chemicals... this superior product moisturizes the skin leaving it silky smooth and the fragrance lasts... a perfect combination! Free custom labels (orders of any 30 or more pre-filled products). Please use the comments section to tell us what you would like printed on the 2 available custom lines. Your favorite fragrances in a moisturizing base with aloe and vitamin E - no alcohol! $2.50 each when you order 100 or more! 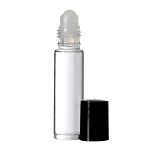 Copyright Perfume Oil Direct - Body Oils & Supplies at Wholesale Prices.. All Rights Reserved. eCommerce Software by 3dcart.